On Thursday, John Mellencamp took the stage in South Bend to promote the release of his 24th studio album, “Other People’s Stuff.” Mellencamp has been writing and performing his own songs for over 40 years, since his first professional album in 1976. Mellencamp took a few years off following disagreements with music executives and a heart attack in 1994, but never stopped creating and, likewise, his fans have never stopped listening. Despite the constant pressures of performing his music, Mellencamp has found the time to paint, raise five children and earn spots in both the Rock and Roll Hall of Fame and the Songwriters Hall of Fame. Walking into the show was exactly what you’d expect — people in good spirits crowded in to revisit the songs and feelings of their youth, but also to enjoy Mellencamp’s voice on modern issues as well. The first 20 minutes of the show were a combination movie and slideshow that followed Mellencamp’s history from the beginning of his music career to his current life focused on family and songwriting. Yet, it was clear that everyone in the crowd that night didn’t need the recap. They came to hear the songs they loved and the artist they had been fans of for years. There were a few nostalgic scenes of interviews Mellencamp gave when he was in his 20s and 30s, and flashes of him promoting his music on early MTV, but the theme of the film was that Mellencamp didn’t know what he was getting himself into when he first started in the music industry. The introductory film showed the audience how he had to change his last name to appear more attractive and emphasized the decisions others made for him. But that night, Mellencamp was able to tell his story, which included his political leanings, life experiences thus far and his confrontations with people that told him what to do with his voice. 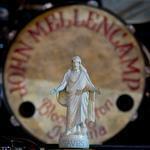 But, even more importantly, Mellencamp let the music speak for him. There were brief interludes when Mellencamp would preface his songs with explanations or casually talk to the crowd. For example, he explained how “Longest Days” was partly about a conversation with his grandmother as she neared the end of her life. Throughout the show, Mellencamp also made comments about how the world needs to get itself together. The setlist was well-organized with a few songs to introduce the tone of the show, a nostalgic section, a part for rumination on life and the passage of time, some political commentary, an anti-authority segment and feel-good closers. The newly folksy-liberal Mellencamp sound was present from the beginning when he opened with “Lawless Times” from his 2014 album after walking out to long cheers and whistles. He played a combination of entirely familiar songs, like “Minutes to Memories,” “Small Town,” “Jack and Diane,” “Pink Houses,” “Hurts So Good” and less-popular pieces like “We Are the People.” The song “The Full Catastrophe” was bluesy, jazzy and low, while “Easy Target” called out persecution and ignorance of the marginalized by politicians and corporations, finishing with a Black Lives Matter protesting kneel. The most energized moment though, came when he played “Authority Song” followed by “Crumblin’ Down.” Everyone up and dancing. Energy throughout the show was always at hand, but shifted between sit-down songs, fist-pumping calls to action and shouting of old favorites. The solos by every musician were impressive, as the band members were all as talented on their instruments as Mellencamp himself. The most notable band member on stage and the crowd favorite was Miriam Sturm on the violin, whose work fit perfectly with the rock sound yet stood out memorably that night.